This book contains exciting, fun stories and activities to help you understand how to live a healthy, happy life. What conditioning is and how it can make you act like a Robot! What made a boy think he could fly like Superman! How war is created by the way we think! Creative, nonviolent alternatives to fighting! This Book is for Adults Too! This Book Will Help You Understand How Conditioned Thinking Prevents Peace! "Faster than a speeding bullet, able to leap tall buildings in a single bound. Look, it's a bird! It's a plane! It's Superman!" Billy had just finished watching the video "Superman" and his favorite regular TV show, "Superboy." was now on. He watched the image of his caped hero leaping tall buildings. He draped a towel over his own shoulders to feel like Superboy as his eyes took in the images of human beings performing superhuman feats. When the show ended, the boy stretched and yawned. He turned toward the stairs of his house and climbed to the third story. He walked over to the only window and opened it. Expressionless, he looked down the many feet to the ground below, and then climbed onto the window ledge. It was a glorious summer evening, and he felt a rush of energy pulse through his small body. He felt powerful. Billy's mother was downstairs in the kitchen washing dishes. Her husband was in town doing errands, and she was thinking of what to make for dinner. She heard the sound of the TV and felt assured that her son was safely involved in his favorite show. As she washed dishes before the kitchen window, there was a sudden movement—as if a large bird had dropped from the sky, swooping down to the ground. There was a loud thump and a small human cry. Shocked for a moment, the mother stood frozen with water running over her hands, thinking "Bird? Or boy?" Terror gripped her heart as she raced outside to find her son lying on the ground, the Superboy towel-cape draped over his still body. Miraculously, he groaned and began to move. Incredibly, Billy was not hurt. He had fallen three stories and didn't have a scratch. "I did it, just like Superboy!" the young boy exclaimed. Billy's parents were thankful and amazed that their son was all right, but they were disturbed because he did not seem to understand the danger in what he had done and how lucky he had been. Because he had been unhurt, they were afraid he might try it again and really hurt himself. To convince him of the danger, the boy's father went up to the third story and pushed a large watermelon out. The melon fell heavily through the air and landed with a shattering thud in a mass of squashed pieces. This book is about our physical and mental conditioning, how it effects our way of thinking and living. We can have good or bad conditioning in our lives. Conditioning is the cause of conflict. We are conditioned by our surroundings, for example, our friends, families, teachers and activities. Things we do like going to the movies, can condition us. Conditioning isn’t always bad. It can be good too. A good conditioning can be when your parents teach you to clean your room when ever it gets messy. A bad one can be whenever someone makes a mean remark, you go and do to them what you saw on TV. Conditioning can be bad or good, it all depends on our surroundings. It can keep peace or it can resolve to war. Fighting the Invisible Enemy is a very good book. I like how the stories are written because I can relate to them in my daily situations. These books are good because it teaches me to stay calm in a verbal fight and not mouth off so I can stay out of a fist fight. I like these books because they calm me down after a hard day at school. I really liked one story because it really got me focused on my studies, and to focus on what’s at hand and not wander out of focus. I like how Dr. Terrence Webster-Doyle writes his books because I can relate to them in my everyday life. After I read the book Fighting the Invisible Enemy, these are some of my thoughts. One situation in the book that related to me was the bully Eric. I sometimes got bullied in 4th grade. I solved it by making friends with the bully. I also liked the story about the boy who thought he could fly. I never got influenced by a TV before. I liked the activities like the mind tricks. I liked the impossible magnet. Terrence Webster-Doyle is very inspiring. He thoroughly explains how conflict is caused. Conditioning can cause conflict by believing that going to church is good and not going to church is bad. He explains how to meditate. I did what he said and focused on sleep and I went to bed. My dad and I played the game near the end of the book. We played the detective game. My dad was afraid of sharks and I was afraid of a burglar. I didn’t have a suggestion to overcome his fear, but he had a suggestion for me. My dad reassured me that our house was all locked up at night and I could sleep tight. His book was very good. I loved it. I can’t wait to read his next book. We should be honored to know that he visited our school. 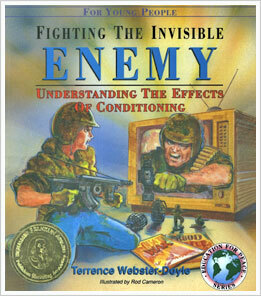 Fighting the Invisible Enemy was a great book. It teaches anyone that reads it that they are conditioned and that what they are conditioned to believe is powerful and it may not be right. Conditioning is the way someone wants or teaches you or makes you believe that doing something or believing something is right and this may lead to conflict. Not everyone believes in the same thing, and when two people believe in different things this causes conflict, each of you think that you are right in what you believe. In this book it taught me that there are other ways to deal with conflict than to fight. It showed me ways to get out of confrontations and that fighting is bad and should only be used as a last resort. In this book I was able to understand that conditioning has effects and sometimes we are conditioned to believe things that we are not sure if they are what really happened. When you are conditioned there are effects like you do not like certain people for a reason but you might actually like them once you meet them, but your conditioning tells your brain that you are not going to like that person. One of my favorite stories in this book was the boy who thought he could fly. It teaches that sometimes your brain can’t tell the difference between reality and fantasy. 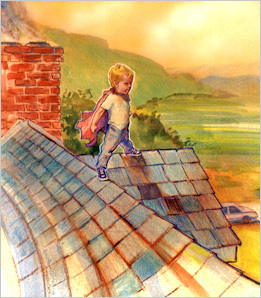 The story tells about a little boy named Billy and that he liked Superman a lot and wanted to be like Superman so he climbed to his roof after watching the Superman show on television and jumped off the roof he soon fell to the ground. He was luckily not hurt but he could not tell the difference of why Superman could fly and not h im. I enjoyed reading this book it gave a better understanding of why our country sometimes fights in wars. We can try and prevent war from happening again by solving our conflict in a nonviolent way. I think that if everyone were to take a small part in solving conflict within themselves the world would not fight as much. This book was about conditioning and how it affects us. It talks about all different types of conditioning. It says that people are conditioned to have certain beliefs, customs, traditions, and habits that can sometimes cause us to prejudge other people because they are different in some way from us. The book also teaches about how to get out of conflict without running or fighting but by talking it out. I think that more people should read this book because more people would get along better and be happier in life. This book was about showing you the meaning of martial arts. It was about helping you understand how to live a happy and healthy life. I learned that conditioning can make you function like a robot. It also taught me nonviolent ways of solving conflicts. It taught me that how we think is not all what we know. It showed me how to understand conflicts better. It taught me how thinking prevents peace. It helped me understand the effects of conditioning.